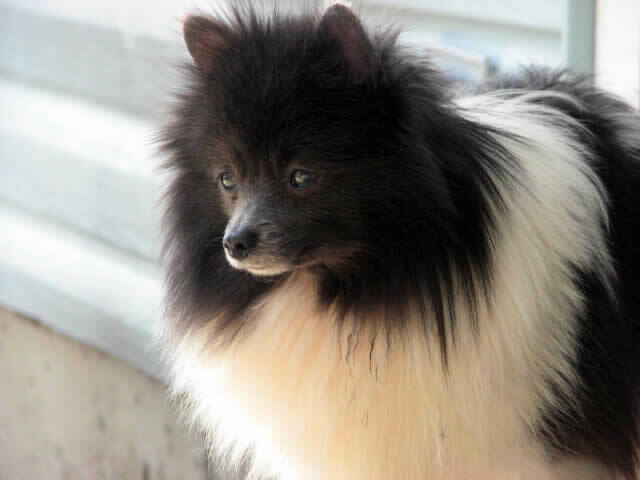 My wife and I have rescued an abused Pomeranian from a horrible puppy mill. This poor guy has sat in a small cage for over two years, and can hardly walk. He is absolutely terrified and takes a lot of coaxing to get him out of his cage. My wife gave him a bath when we got him home last night and he still smells pretty bad. Apparently he wasn’t even allowed out to go to relieve himself. He was just stuck in his cage and was found chest high in excrement. Over time it is our goal to rehabilitate him and make him comfortable around people and other animals. We sure have our work cut out for us with this one! I have a feeling my husband has fallen in love with Panda and wants to adopt him. I’m not 100% sure yet. He says he needs a couple of more days to “decide” but I think he already loves him. He has taken a whole cartridge full of pictures of him on the digital camera already and they were both chasing each other around the house. He said he wanted a border collie but he says Panda looks just like a miniature border collie. Panda was immediately adopted and is now so well loved & taken care of by Deanna and Mike! Thanks for loving a puppy mill dog!